It’s interesting to see the disarray that the Vote for Change folk seem to be in. Yesterday’s Kiwiblog post on them has pictures of two crowd-sourced billboards – neither of which are logical*, let alone compelling. And then the comments underneath seem to be running majority in favour of MMP. If Vote for Change can’t muster a simple majority (ha ha) among the Kiwiblog comments you wonder where they are planning to get their support. $10,000 in prize money to promote something, anything, we’re still not quite sure what yet, so long as it makes sure that some people’s votes are worth more than other people’s. *e.g. the first billboard seems to have forgotten that Winston Peters came to power and prominence under First Past the Post, then lost his seat under MMP. And, as for the second billboard, surely the concern is supposed to be that tails wag dogs not that dogs wag tails? Well, I thought the bad taste blog of the year would likely belong to Whaleoil. But right on Christmas Eve, David Farrar has plumbed the depths. For no apparent reason, and with no substantive commentary under the supposed “humour” category, Farrar has posted a piss-take video of Mariah Carey’s “All I want for Christmas is you” – the title: “All I want for Christmas is Jews. That’s okay he rose three days later. Now, like DPF, I’m not a religious person. But this stuff is simply not funny. It is blatant racial stereotyping of Jewish people, as well as lacking historical accuracy – by all accounts I have read, it was the Roman occupiers of Palestine and their Jewish collaborators, rather than representatives of the Jewish people, who were responsible for the death of Jesus. So why, DPF, did you have to post this piece of racist drivel, likely to offend both Jews and Christians, at all – let alone on the eve of a significant Christian festival? From Kiwiblog this afternoon we find out that National is signposting the way to an Aussie flag. That’s a vote winner. Aussie, Aussie, Aussie – Oi, Oi, Oi! 5 weeks ago I blogged about the possibility of the Greens getting their 13th ranked candidate Mojo Mathers elected. Well, I thought I might have been overly optimistic then, but not now! Seems the Greens are on a roll. We’ve had three polls in the last week. 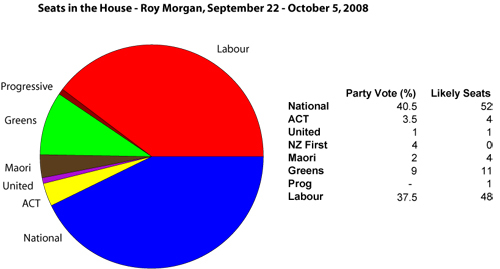 OneNews showing the Greens at 7.0%, Roy Morgan at 9.0%, and TV3 at 6.8%. Having been languishing just above the 5% threshold for most of the Parliamentary term, these polls have to be very encouraging. We need 11% to get Mojo Mathers elected. It seemed a pipe dream 5 weeks ago, but now could be a possibility. Meanwhile, David Farrar at Kiwiblog has done an analysis that on current polling the Maori Party could decide which of the two bigger parties leads the next Government. So things are looking good in that regard too, given that the Maori Party and the Green Party have much in common re supporting ecological responsibility, social justice, and developing a genuine Tiriti relationship, and most often vote the same way in Parliament. The punters are running feral over at Kiwiblog, inspired by Jeanette’s appearance on Close Up last night defending the proposed energy efficient home hot water standard. Most are trotting out the tired old “nanny state” line and falsely claiming the Greens are wanting to ban high pressure shower heads. And someone called Brad got so excited about it that he’s come to g.blog and posted a comment (naming his bathroom with capital letters) in the g.blog rules thread, because he couldn’t find anywhere else appropriate. So I thought I’d give Brad a thread to comment on, and clear a few matters up. First, this is not a ban on anything. No-one will be forced to change their shower head. The standard will apply only to new buildings and to major renovations. The proposal is for new homes to have more energy efficient hot water systems. An efficient hot water system will save homeowners money by lowering power and gas bills. But instead of doing some research and finding out about it, the Kiwiblog commenters and Brad just resort to the tired old “nanny state” / “it’s a ban” routine that they inevitably use to attack the Greens. I’m surprised they didn’t come up with a high pressure energy inefficient shower head being necessary for effective child discipline too. Today’s efforts from the Kiwi Party are beyond belief. Their sole MP, Gordon Copeland had a Parliamentary Oral Question opportunity today. Now, as David Farrar points out at Kiwiblog, Copeland gets only about one primary question a month. But he failed to submit his today. So there were only 11 questions, rather than the usual 12. I wondered why. But then at 3pm, I received an email containing Gordon’s Copeland Chronicle. So I guess he was just too busy finishing off writing the Copeland Chronicle to get round to his Oral Question. Funny thing is that I went to the Kiwi Party website to find the Copeland Chronicle and link to it here, and it wasn’t there. I guess Gordon hadn’t got round to uploading it to the website either. And it’s dated August 2008 – in case you haven’t noticed, Gordon, it is now well into September, so I guess you must have been writing it for most of the last 2 weeks! I’ve uploaded it to g.blog, to help Gordon spread his message. I do like the bit about the recreational hunting and fishing rights and banning aerial application of 1080 poison, but I’m far from keen on most of the rest of it. So, God better be on your side Gordon, because with this level of competence, I think you’ll need Him. Ever noticed the advertising on Key wee-blog? Well eventually, not now. Once David has sorted out his advertising contract, you know what I mean. Jeanette Fitzsimons blogged this morning on frogblog about the preoccupation of the media with what Winston Peters may have said and done. The tragedy is that this is what passes for news, when we ought to be debating what is happening to our economy with rising prices for food, petrol, power and mortgages at the same time as economic contraction and loss of jobs? Shouldn’t we be debating the causes of this, and linking them with peak oil, resource limits and climate change? Most of all, shouldn’t we be debating what to do about it? It’s not just the MSM – over on Key wee-blog David Farrar has devoted an extraordinary 34 separate threads in the past week to various aspects of Peters’ alleged behaviour, and what others have said and done in response to it. Now, I’m not suggesting the allegations against Peters are not serious. They are. But they are being investigated by both the Serious Fraud Office and Parliament’s Privileges Committee, and all will come out in due course. In a week when we saw Labour announce its Emissions Trading Scheme will go ahead and National announce it would be supporting tolls on roads, I would have thought both the MSM and bloggers might have been giving these issues some more attention. Will the Government’s ETS be effective in reducing greenhouse emissions? Are the transport and agriculture sectors being brought into it too slow or too fast? Will people on low income be adequately protected against emitters passing on the cost of their emissions? What roads will is National proposing to toll? Whose policy is the real one – Maurice Williamson’s or Bill English’s? How much will the toll charges be? What will the revenue be applied to – public transport infrastructure, or just more and more roads? These are the real questions people should be asking in deciding how to cast their votes in an election that is less only 10 weeks away? Peters’ credibility is already close to zero – so let’s focus on the policies. Kiwiblog gave a list of 10 ‘axioms’ yesterday about economics. The problem was that all 10 are true only in the sense that they are good for the economy because a good economy has been defined in such a way as to make the axioms true. Take for instance the worst of Farrar’s ten, number 4; The best measure of a good economy is its growth. Why do we assume all growth is good? A growing tomato vine is good, a growing weed, not so much. Yet we measure both as though they are the same. Even though top economists might not agree with me a growing economy is not necessarily a good economy. Putting aside the issue that we currently use a measure of growth (GDP) that includes a whole lot of weeds on the positive rather than the negative side of the ledger, sometimes you can just have too many tomatoes. A little bit of pruning, a little bit of restrained foresight, a little bit of diversity maybe better than the monoculture growth that economists want. It’s self evident that you only need as much food in your fridge as you can eat – too much more would be wasteful rot. And off course, any gardener will tell you what happens to the land when you push it too hard and try to get too much growth out of it too fast.